There were few surprises in the USTA Boys 18s Nationals the first five days, but that changed in Wednesday’s round of 16, with No. 3 seed JJ Wolf eliminated by No. 26 seed Timothy Sah 3-6, 6-2, 7-6(2). Sah, who turned 17 on Tuesday, had come back from a set down in his previous three matches, so he was hardly discouraged when he found himself in that position again. The third set featured ten consecutive holds before Wolf broke for a 6-5 lead. Serving for the match, the 17-year-old from Cincinnati won the first point, but Sah took the next four to force a tiebreaker, a situation he experienced in his third round match, but not before. Sah ranked his win over Wolf as probably his best: “He’s such a good player,” Sah said. Next up for Sah is No. 6 seed Zeke Clark, who beat No. 9 seed Nathan Ponwith 7-5, 6-2. Drama of a different sort had preceded Sah’s third set tiebreaker win, as No. 5 seed Gianni Ross managed to survive a late-match vomiting incident to beat No. 14 Austen Huang 6-1, 6-4. 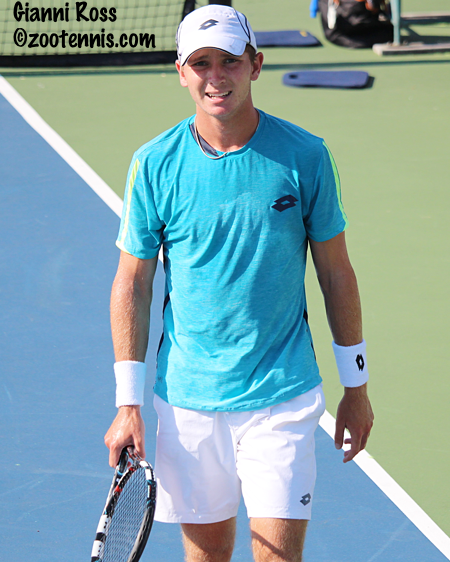 Ross said he began to feel sick early in the match and took a bathroom break at 3-4 in the first set, so did not blame the hotter and more humid conditions that moved into the area for his illness. At 4-4 in the second set, Ross went to the backdrop below the stands, feeling sick, but received a time violation warning from the chair umpire. Determine to avoid a point penalty he went to the line, tried a first serve, missed, and then got sick, right on the baseline. The chair umpire called for a trainer and walking to his chair, Ross vomited again near the service line. 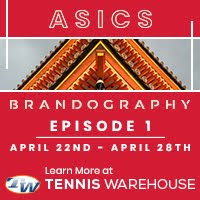 A 20-minute delay ensued while the court was cleaned up, and then disinfected, and when play resumed after a warmup, Ross had to hit a second serve, because the delay was his responsibility. Ross ended up winning the game, giving him hope a break would end the match. Ross said his desire to win the match never wavered. Ross will play top seed Michael Mmoh Thursday in the quarterfinals, after Mmoh defeated No 10 seed Oliver Crawford 6-1, 7-6(4). Mmoh couldn’t shake Crawford in the second set, but his backhand was effective all day and an ill-advised drop shot attempt late in the tiebreaker cost Crawford a chance to send it into a third set. The other top half quarterfinal in the 18s will feature No. 4 seed Sam Riffice against No. 8 seed Trent Bryde. Riffice cruised past No. 12 seed Jacob Brumm 6-0, 6-1, and Bryde defeated No. 29 seed Alafia Ayeni 6-2, 6-3. No. 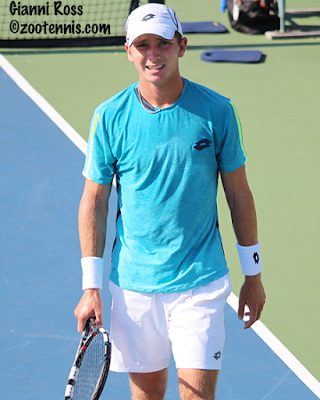 2 seed John McNally won his fourth consecutive straight-sets match, beating No. 27 seed John Speicher 6-4, 6-2. His opponent in Thursday’s quarterfinals will be No. 7 seed Vasil Kirkov, who defeated No. 11 seed Alexandre Rotsaert 6-4, 6-2. Top 16s seed Lukas Greif has had no difficulty this week, beating No. 9 seed Cannon Kingsley 6-2, 6-0 Wednesday, but No. 2 seed Christian Alshon and No. 3 seed Jared Pratt joined No. 4 seed Kevin Zhu on the sidelines today. Alshon was beaten 7-5, 7-6(4) by No. 15 seed Robert Maciag, who trailed 5-2 in the second set. Maciag had beaten Alshon this spring at the Easter Bowl, after having lost their previous meeting. “Every time we play, someone’s ahead and the other guy has to rally back, regain the advantage,” said Maciag. 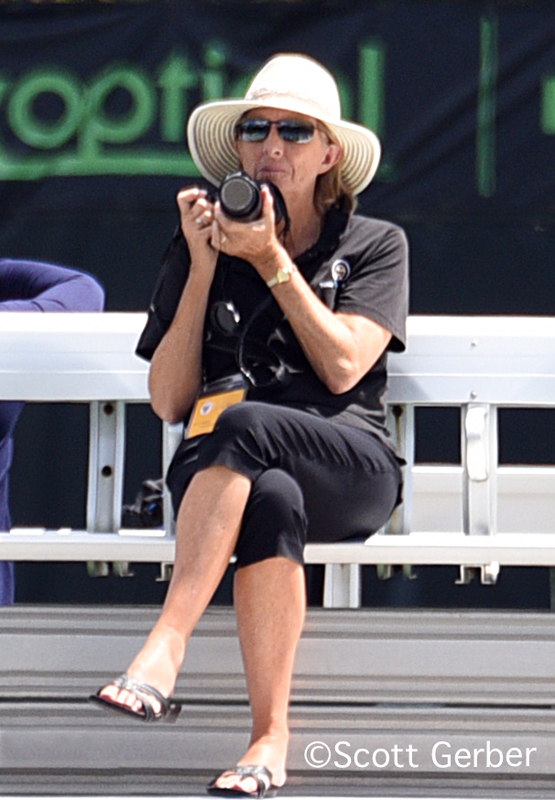 “So this time, I’m glad it was me.” Maciag will play unseeded Sangeet Sridhar, who ousted No. 18 seed Danny Thomas 6-7(3), 6-3, 7-6(2). Pratt was defeated by No. 13 seed Trey Hilderbrand 7-5, 6-4, with Hilderbrand meeting No. 10 seed Jenson Brooksby in Friday’s quarterfinals. Brooksby, who reached the Clay Court final last month, defeated local player Bill Duo, the No. 24 seed, 6-3, 6-3, much to the disappointment of his group of supporters in the Stowe Stadium stands behind Acker Court. Greif’s opponent in the quarterfinals will be unseeded Blake Croyder, who took out No. 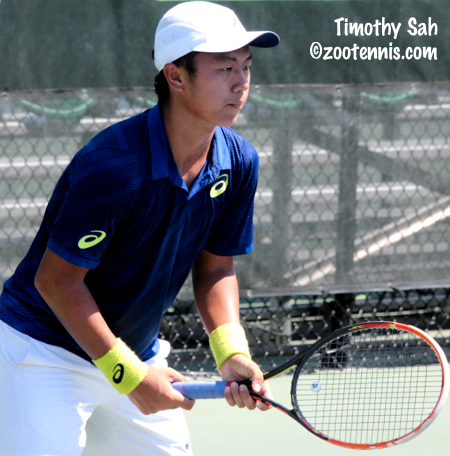 7 seed Brandon Nakashima 6-4, 6-2. 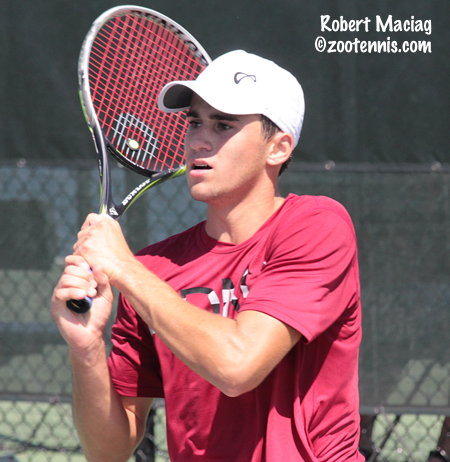 The other top half quarterfinal in the 16s will feature yet another unseeded player in Matthew Tsolakyan, who beat No. 20 seed Drew Baird 6-1, 3-6, 6-3. Tsolakyan will face No. 16 seed Keenan Mayo, who won his third three-set match of the tournament today, taking out No. 6 seed Axel Nefve 7-6(5), 0-6, 6-3. Due to weather concerns on Friday, the traditional split of the quarterfinals will be done by division, not by the top and bottom sections of the draws. The 16s will play on Friday, with the 18s scheduled for Thursday. See ustaboys.com for the revised schedule. The 18s doubles quarterfinals were played Wednesday evening as part of the Dinner at the Nats promotion. See ustaboys.com for the evening’s results.